Arctic sea ice just won’t play the game! LITTLE gem of a read by Harry Wilkinson on the condition of the Polar Ice Caps and the overtly propagandised meltdown hysteria promulgated by alarmist ‘scientists’ and their government institutions, gleefully pimped out by the ever-compliant global warming theory-obsessed mainstream media. WILKINSON lays out basic empirical facts that shamelessly contradict the repetitive “Death Spiral” moans from climate and Arctic experts alarmists. Arctic sea ice is proving remarkably reluctant to enter its appointed ‘death throes’, despite the usual suspects having already planned the funeral. Climate Change Anxiety Disorder, it turns out, is yet to impose its angst on the actual climate, no matter how hard the BBC tries to make it. The latest observations show that Arctic sea ice is on course to have a greater minimum extent than in 2015 and 2016, and is running higher than levels seen a decade ago. 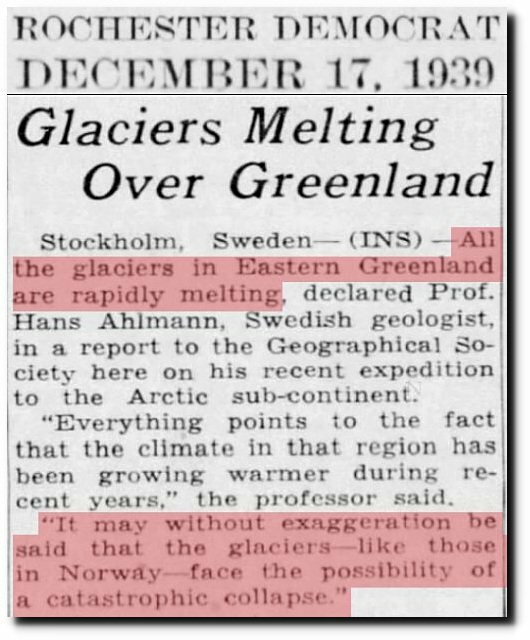 Back then, the BBC reported that Arctic summers may be ice-free by 2013, although this estimate was described as being ‘too conservative’. 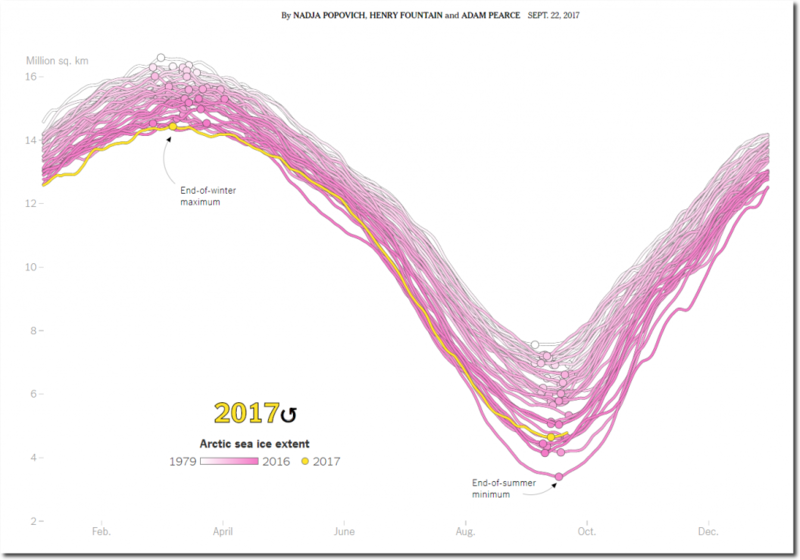 That prediction was spectacularly wrong, and contrary to warnings of an ‘Arctic death spiral’, sea ice extent has been remarkably stable in the last decade. No one can say what exactly will happen next; if this humbling affair teaches anything it should be precisely that. The climate has misbehaved in other ways too. The Greenland Ice Sheet has been gaining mass at a record rate for the second year running, and Antarctic sea ice extent is perfectly normal relative to the 1981-2010 average. These facts get little coverage because they don’t sound alarming at all, and for most reporters that means they’re not news. These ‘inconvenient truths’ are nonetheless a helpful reminder that climate change coverage should be taken with a healthy dose of scepticism. There is a long way to go before we can make accurate predictions about how the climate will behave, if indeed we ever can. Climate science has to be more deeply grounded in real-world observations rather than models that are inevitably riddled with flawed human assumptions. 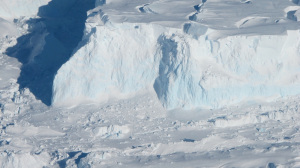 NO wonder climate catastrophists have switched poles and are picking on Antarctica, for now! Arctic first-year and multi-year sea-ice breaking all sorts of decadel records, wrecking their “Arctic Death Spiral” agenda up there! Lol. Despite pronouncements from one polar bear specialist that “ice in Hudson Bay is in rapid retreat” a look back in time shows that there is more thick first year ice over the Bay this year for the week of the summer solstice than there was in 2004 – and much less open water than 1998. Ice coverage for some other recent years are shown below compared to 1998, the year the ice breakup pattern on Hudson Bay changed. Speed and melt sequences vary according to the amount of thick first year ice present, discussed previously here. Arctic sea ice volume is normal and highest for the date in 13 years. ‘Bias by omission’ – the most dangerous and insidious form of propaganda. Climate Change Disables US Navy’s Newest Ship! FROM the department of “Human-induced Global Warming represents a National Security Threat” caused by errr…too much Ice! Climate Change Weather Disables US Navy’s Newest Ship! A brand-new U.S. Navy warship has not moved from Montreal since Christmas Eve and will spend the winter stuck in Canada due to cold and ice. The USS Little Rock – unveiled in a ceremony on Dec. 16 in Buffalo, New York and attended by nearly 9,000 people – has not moved far since due to adverse weather conditions that kept the warship trapped at bay in Canada, the Toronto Star reported. The warship known as a Littoral Combat Ship (LCS) cost $440 million to build and stretches 387 feet in length and weighs 15 tons more than the Statue of Liberty. It is capable of traveling more than 46 miles per hour. CONTRARY to popular myth, Arctic sea ice extent is not in a “death spiral“. In fact, there has been no real shrinking of Arctic sea ice in 10 years, which also corresponds to the fact that there has been no statistically significant “global warming” for nearly 20 years. ALL this despite record “CO2” emissions over the same period, and record hot air bloviated by the trillion dollar climate crisis industry. 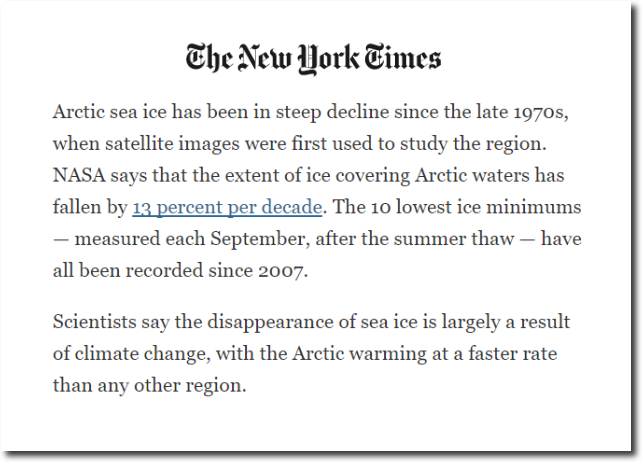 The New York Times just published another fake climate article – this time about the Arctic. 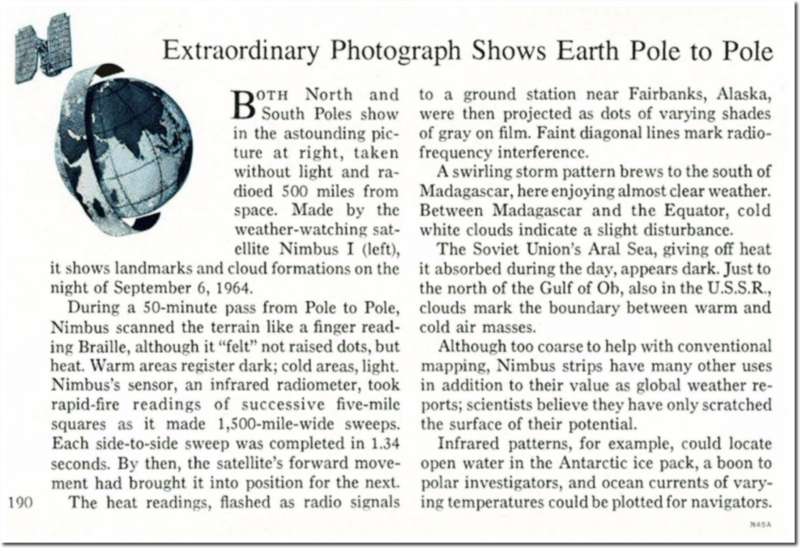 They start the article with the claim that satellites were first used to study the Arctic in 1979. Given that we traveled to the moon in 1969, it is absurd to suggest that satellites weren’t used to study the Arctic before 1979. Here is a 1964 satellite image of the Arctic which was published in National Geographic in 1965. 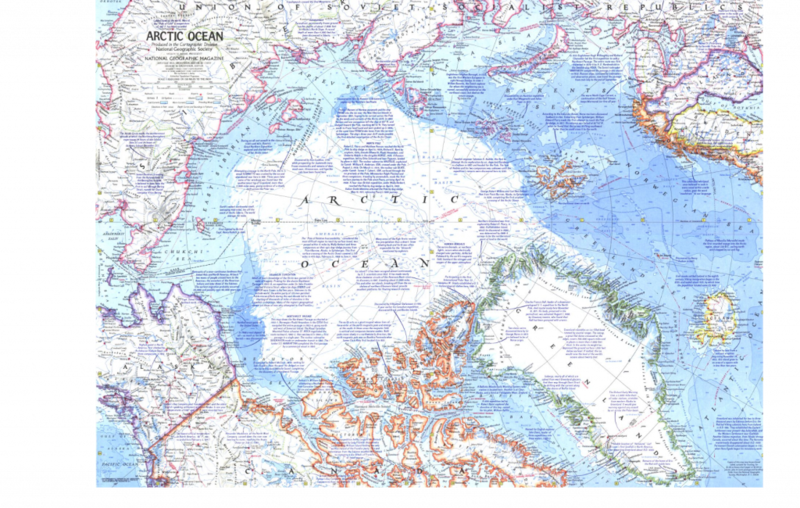 Here is a detailed National Geographic Arctic sea ice map from 1971. 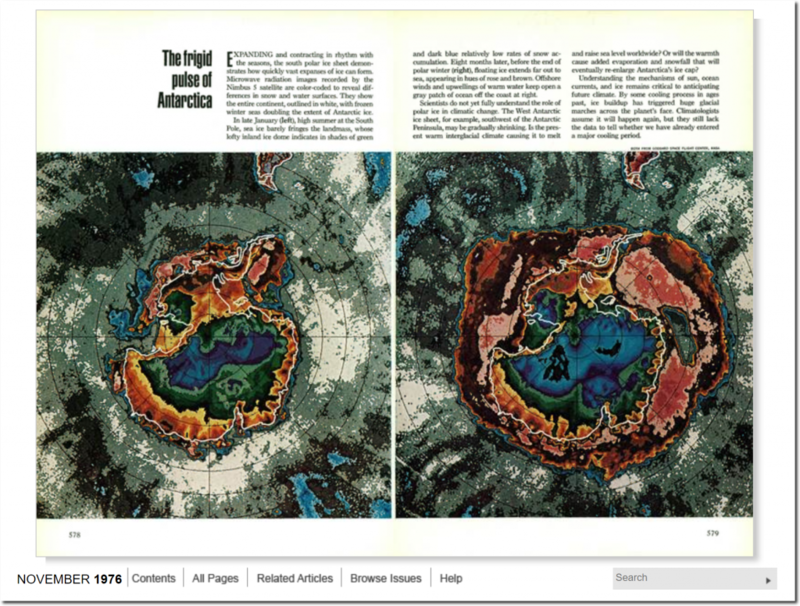 Here is a detailed satellite image of Antarctica from 1976, also published in National Geographic. 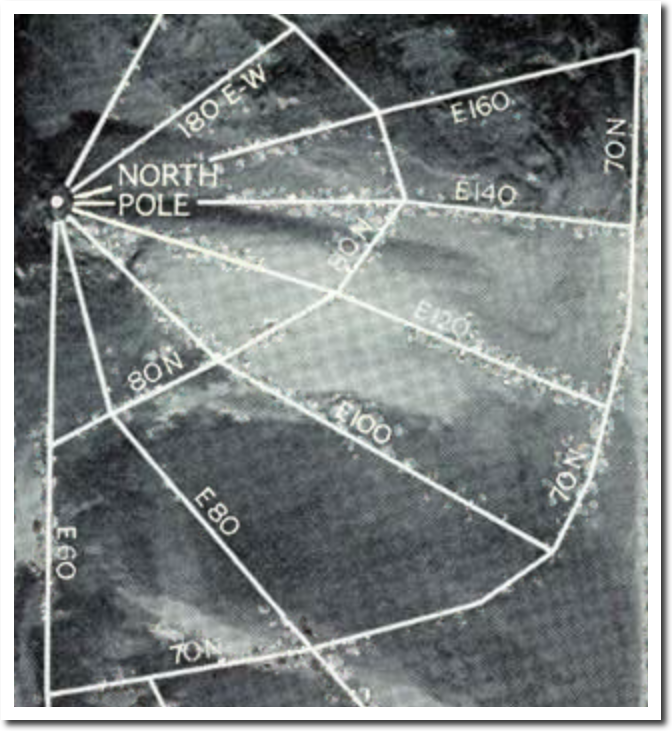 The 1990 IPCC report included NOAA Arctic satellite data back to 1973, when it was much lower than 1979. 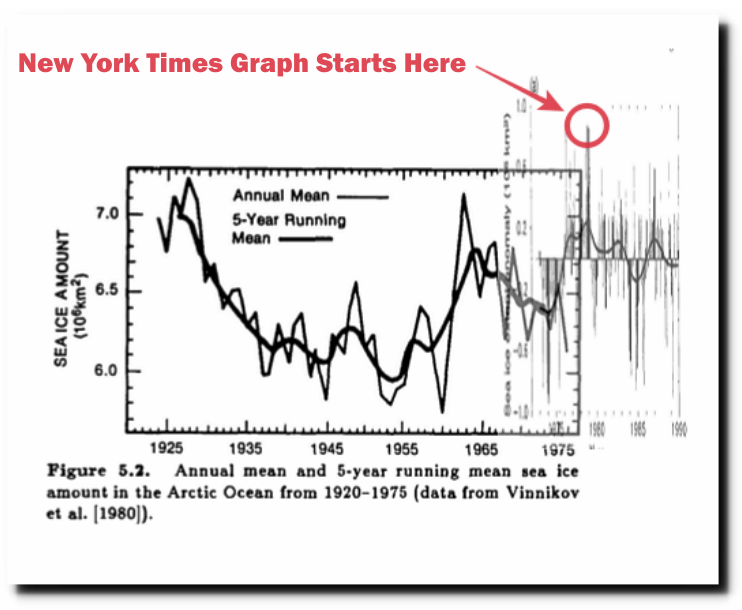 In a spectacular display of scientific malpractice, NOAA now hides all of the pre-1979 peak Arctic sea ice data. By starting right at the peak, they produce a fake linear downwards trend. This 1985 DOE climate change report had Arctic data back to 1925, which showed little ice from the 1930s to the 1950s. So why did the New York Times cherry pick 1979 as their start date? Because it came at the end of three of the coldest US winters on record , and Arctic sea ice was at a century peak. The graph below combines the 1985 DOE graph with the 1990 IPCC graph. 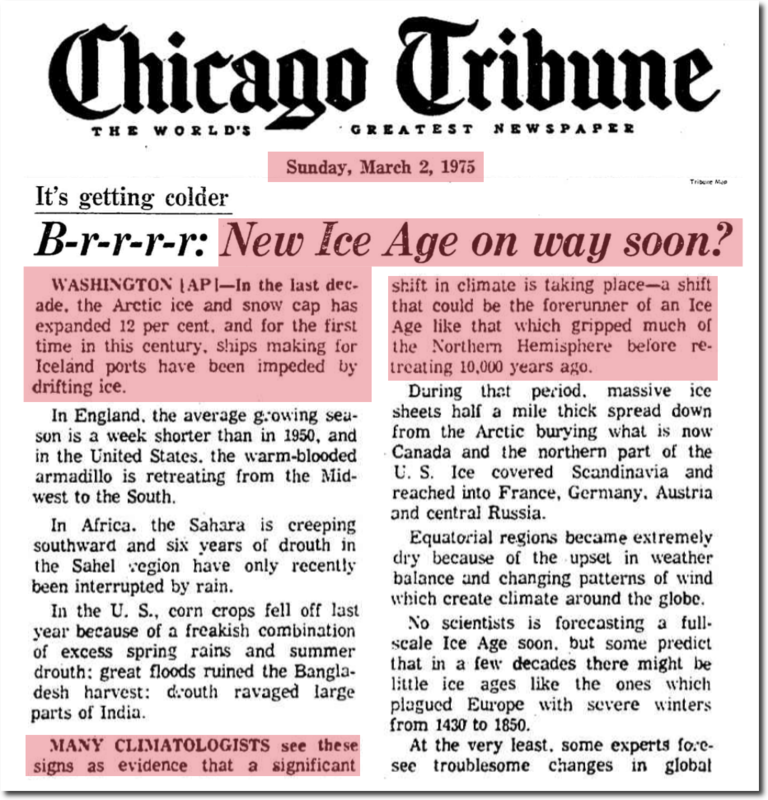 Three years later, the New York Times reported a unanimous consensus that earth was cooling. By 1970, the Arctic climate was becoming more frigid, the ice was getting “ominously thicker” – and scientists were worried about a new ice age. The polar ice cap had expanded 12% by 1975, after shrinking 12% before 1958. Icelandic ports were blocked with ice for the first time in the 20th century. By hiding all the data before the 1979 peak, the New York Times is defrauding its readers. Arctic climate is cyclical – not linear. 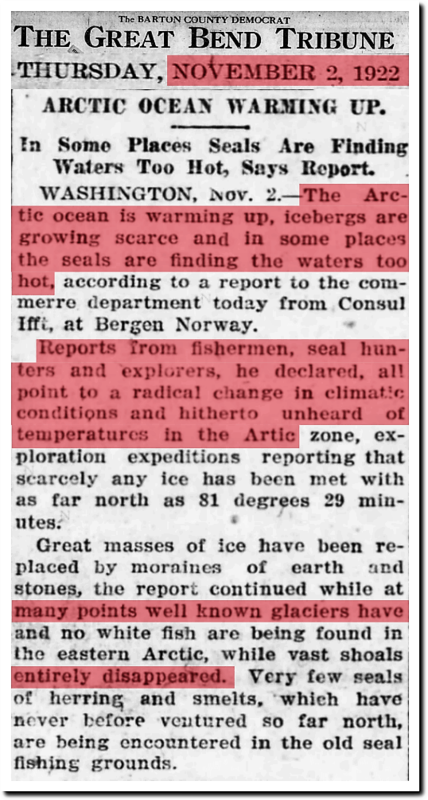 Ninety-five years ago, the Arctic was having a meltdown. 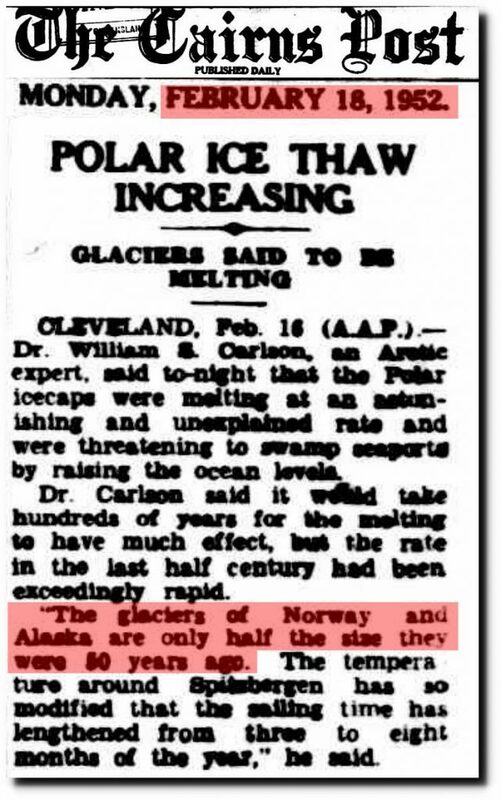 Eighty years ago, the Arctic was having a meltdown. 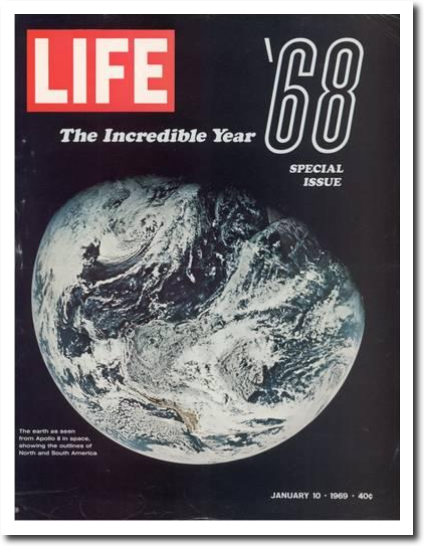 Sixty five years ago, the Arctic was having a meltdown. Then the New York Times went on to obscure their graph (below) to hide the fact that there has been a large increase in minimum extent since 2012. Note the “End of summer minimum” label is at the 2012 minimum – not the 2017 minimum. 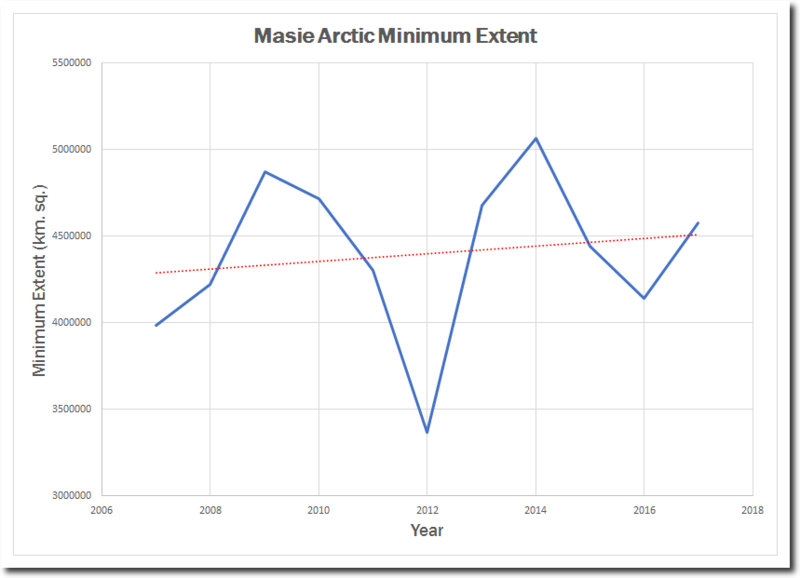 The Arctic minimum extent has been increasing for a decade. The New York Times doesn’t want their readers to know this. The New York Times is defrauding their readers at many levels. It is the fake news we have learned to expect from them. The pause within the pause. Contrary to popular myth, summer sea ice extent in the Arctic is not in a death spiral. As the above DMI graph shows, August extent has been remarkably stable since 2007. Back in March, the “experts” were telling us that the record low extent last winter would inevitably lead to lower summer extent.